Even during the hard times of the 1930s, the Lodge family found ways to keep employees above water. Novelty items such as cast iron garden gnomes and animals were produced and sold to keep the furnaces burning and the paychecks issued. As the economy bounced back, Lodge responded to growing demand, and in 1950 converted its foundry from a hand-pour operation to an automated molding process in order to keep up with demand. This led to safer and more efficient manufacturing that at the time was very rare. Well into our second century in business, Lodge continued to innovate. In 2002, the legendary Lodge Logic line of pre-seasoned cookware was introduced, eliminating the hassle of its unseasoned counterparts. It was an industry first that has since become an industry standard. As Lodge continues to develop the core line of seasoned cast iron, the introduction of complementary lines of cookware has seen great success over the past 2 decades. Lodge’s diverse and colorful line of Porcelain Enameled Cast Iron has earned rave reviews from media and consumers since its inception in 2005, offering the performance of European brands at a much more affordable value. Introduced in 2013, The Lodge Seasoned Carbon Steel line features an assortment of skillets that are American-made and seasoned right at the Lodge foundry. Appealing to both professional chefs and outdoorsmen, these brutally tough pans are the perfect tool for any culinary aspiration. With consumer demand exceeding foundry capacity, Lodge unveiled plans for a considerable expansion of their South Pittsburg plant in 2014. The addition of new melting systems, sand systems, an additional molding line, and expanded seasoning lines has nearly doubled our capacity to make cast iron in the US. In 2016, Lodge has broken ground on two new expansions. The first is a new distribution center for increased efficiency and shipping. The second is an entirely new foundry in addition to our current one. Iron foundries have been recycling long before “being green” was cool. Here are some of Lodge’s continuing environmental success stories. Yes. This is a result of the sand casting process. With use and replenishment of the seasoning, the pan will become smoother. Unlike other types of cookware, Lodge Cast Iron only gets better with use. For concerns about roughness, it is OK to use a fine grade of sandpaper to smooth out the rough areas. Make sure to re-season the item before using. Are there foods that I shouldn’t cook in Cast Iron? We measure from outside rim to outside rim across the top of the cookware, not the bottom. Please note that the item number may differ from the actual size. For example the L10SK3 is not a 10″, but a 12″ skillet. The 10 in the item number comes the days from when cast iron pots and pans were sized to fit on the numbered eyes of a wood stove. The L10SK3 was for a #10 stove eye. There is not a written warranty for Lodge Cast Iron cookware; however, we do stand behind every product manufactured. For product problems, please contact Lodge Customer Care and we will solve the problem to your satisfaction. 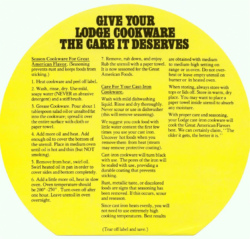 Lodge Porcelain Enamel on Cast Iron is warranted to the purchaser by Lodge Manufacturing Company, Inc. to be free from defects in material and workmanship at the time of purchase. Small cosmetic blemishes inherent to sand casting and hand finishing which do not affect the performance of the cookware are not covered. This warranty extends from the date of purchase, for the lifetime of the original owner. This limited lifetime warranty is exclusive of all other warranties expressed or implied, and is limited to the lifetime of the original purchaser. This warranty is made by Lodge Manufacturing Company, Inc., and no other person or entity. For this warranty to apply, the owner must follow use and care instructions provided with the product. Warranty covers normal household use, but does not include damage from use in commercial establishments, abuse, neglect, abnormal wear, overheating, or any use not consistent with the directions included with the cookware. Defective cookware will be repaired or replaced at Lodge’s option, free of charge, with a similar product or one of equal value if the defective product is no longer in production. Replacement with the same color cookware cannot be guaranteed. Please include your proof of purchase, mailing address and a brief note explaining the defect of the returned cookware. Cast iron comes seasoned and ready to use! Just give it a quick rinse and hand dry, and you’re ready to start cooking. Use any utensils you like, even metal. There is no chemical coating to damage. Cast iron can be used on all stovetops, from induction to electric to gas, even on the grill! It also works great on glasstop stoves. Cast iron performs best when heated and cooled gradually, so give it a few minutes to pre-heat before adding your food. Dry promptlyand thoroughly with a lint-free cloth or paper towel. Rub with a very light layer of cooking oil preferably while the cookware is still warm. Occasionally, you may notice some dark residue on your paper towel or cloth when cleaning. This is perfectly safe – it’s just the seasoning (the baked-on cooking oil) reacting to foods that may be slightly acidic or alkaline. It will disappear with regular use and care. After the iron cookware is cast in the traditional method, a glass particulate called “frit” is applied. This is baked on between 1200 and 1400ºF, causing the frit to transform into a smooth porcelain surface that is bonded to the iron. There is no exposed cast iron on your enameled cookware. The black surfaces, pot rims and lid rims are matte porcelain. The porcelain (glass) finish is hard, but can be chipped if banged or dropped. Enamel is resistant to acidic and alkaline foods and can be used to marinate, cook and refrigerate. Wash and dry cookware before first use. If cookware includes rubber Pot Protectors, set them aside and keep for storage. Enameled Cast Iron can be used on gas, electric, ceramic and induction cooktops, and are oven safe to 500 °F. Do not use in microwave ovens, on outdoor grills or over campfires. Always lift cookware to move. Do not heat an empty Dutch oven or covered casserole. Add water or oil when heating. To sear, allow cookware to gradually come to heat. Brush cooking surface and food surface with vegetable oil just before introducing food into the pan. Use oven mitts to protect hands from hot cookware and knobs. Protect countertops/tables by placing hot cookware on trivets or heavy cloths. Although dishwasher safe, hand washing with warm soapy water and a nylon Scrub Brush is recommended to preserve the cookware’s original appearance. Citrus juices and citrus-based cleaners (including some dishwasher detergents) should not be used, as they can dull the exterior gloss. Remove slight stains by rubbing with dampened cloth and Lodge Enamel Cleaner or other ceramic cleaner according to directions on bottle. To remove stubborn baked on food, bring to a boil 2 cups of water and 4 tablespoons of baking soda. Boil for a few minutes then use a Pan Scraper to loosen food. Always dry cookware thoroughly and replace rubber Pot Protectors between rim and lid before storing in a cool, dry place. Do not stack cookware. * With regular use and care, a slight amount of permanent staining is to be expected with enameled cookware and does not affect performance.